There are two sides to every surgery. Evaluate the perspective of a patient versus a surgeon as they discuss how compassionate care and innovative technology lead to better outcomes. Surgery will never be “fun,” but its goal is to create a better quality of life. 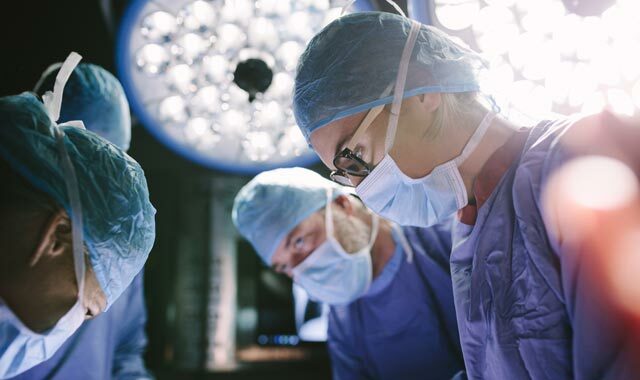 Through compassionate care and innovative technology, surgeons are continuously saving and improving the lives of their patients. Just ask Donna Haen, a patient who underwent surgery four times during 2017. Or ask Dr. Daniel J. Farrugia, a fellowship-trained breast surgeon who exudes empathy for patients and enthusiasm for new technology. Their stories champion the humanity inherent to surgery. Vaguely, Donna Haen remembers waking up around 1 a.m. on April 1, 2017. The pain in her stomach was too intense to ignore. With a history of stomach problems, it wasn’t unusual for Haen to feel uncomfortable; nausea had long ago become a part of her everyday life. But never before had things felt this bad. The doctors at Presence Saint Joseph Hospital, in Elgin, immediately began to “run some tests.” The last thing Haen recalls is the sensation of nasogastric intubation, a process that involved the insertion of a plastic tube through her nose, past her throat, and down into her stomach. Dr. David Ryan, a general surgeon, was working on-call that night. As one of four physicians at Midwest Surgery, with locations in St. Charles and Elgin, he often sees patients at nearby hospitals. He calls his schedule “predictably unpredictable,” since he knows he could be needed at any moment during his on-call shifts. As a general surgeon, he has a wide scope of knowledge. For the most part, he does abdominal surgeries – hernia repairs, appendectomies – but he also deals with colon cancer, gallbladder disease, a variety of skin cancer problems and other emergency cases. For him, it’s routine to spring into action in the early morning hours when a patient is in need. “I think people sometimes look at medicine, and particularly surgery, as a glamorous lifestyle where we think of ourselves as elitists. But, that’s certainly not typical of the average surgeon,” Ryan says. When Ryan arrived at Presence Saint Joseph Hospital, Haen was already in critical condition. The pain that woke her during the night was due to gastrointestinal perforation, also known as a perforated bowel. A hole had developed somewhere in her digestive tract, and an emergency surgery was necessary. The next thing Haen remembers is waking up in the Intensive Care Unit (ICU). She was shocked to learn the date and hear of the events that had transpired. “My daughter was at my bedside and I said to her, ‘We’re supposed to be in Arizona,” and she told me ‘Mom, it’s April 5,’” Haen recalls. Four days had passed since she initially arrived at the emergency room. First, Haen learned she underwent an ileostomy procedure. Dr. Ryan had surgically created an opening (stoma) in her abdominal wall so that he could bring the end of her small intestine (ileum) onto the surface of her skin. This allowed for a pouch to collect her digested food. But even more shocking, Haen learned that she also had a stroke while in the ICU. Haen spent a month at Presence Saint Joseph Hospital, with 10 days total in the ICU. Over the next few months, she would end up seeing Dr. Ryan three more times for surgery. On July 20, 2017, he reversed her ileostomy during a scheduled procedure. But in September, Haen had another emergency. And yet another in November. The bowel blockages were caused by a buildup of scar tissue from Haen’s previous procedures. Once again, for both emergencies, she rushed to the hospital during the night. December was the last time Haen saw Dr. Ryan. She went to his office for a follow-up appointment. Though she’s at a moderate to high risk of having another bowel blockage, she’s been doing well this year. She follows up with her regular doctor, eats healthfully and stays active. “I’m in tune with my body now, so if it happens again, I’ll know to get to the hospital right away,” Haen says. To be a surgeon, compassion is crucial. This is the philosophy of Dr. Daniel J. Farrugia, a fellowship-trained breast surgeon at Centegra Physician Care and the medical director of the Comprehensive Breast Program at Centegra Health System, in McHenry County. Farrugia felt drawn to cancer surgery because he knew that in order to achieve successful outcomes, it was necessary to develop a strong, personal connection with each patient. He also enjoys how breast surgery, in particular, requires the use of advanced technology for diagnosis and treatment. “It’s just as much an art as it is a science,” he says. In addition to completing a fellowship in breast surgical oncology, Farrugia also earned a Ph.D. at the Mayo Clinic College of Medicine. His research concentrated on inherited breast cancer. “At the time, it hadn’t been long since we discovered that the BRCA1 and BRCA2 genes are responsible for inherited breast cancer, and I was very interested in studying these genes and identifying those mutations that put a woman at risk,” he says. To date, his research has been cited more than 1,200 times in medical literature. Today, Farrugia focuses on treating breast cancer patients at Centegra. Since surgery remains the mainstay of breast cancer treatment, he’s often the first specialist to meet with a newly diagnosed breast cancer patient. Thus, his job also involves collaborating with other specialists, including those at the Centegra Gavers Breast Center and at the Centegra Sage Cancer Center, to provide patients coordinated treatment. Genetic testing and counseling, medical and radiation oncology, plastic surgery, nutrition support, rehabilitation services, psychosocial support, financial counseling, art and music therapy, water therapy, and several complementary therapies may be involved. Farrugia and his colleagues also bring new advances to Centegra to give patients access to the best diagnostic technology and breast cancer treatment methods. Recently, the hospital acquired new technology to make breast cancer surgery easier for patients. Breast surgeons and radiologists at Centegra now utilize radiofrequency localization tags, a technology that marks the exact location of breast tumors to be removed and improves patient comfort before a lumpectomy surgery. Surgeons can also use this technology for biopsies when it’s unclear whether or not a patient has breast cancer. Now, radiofrequency localization tags can be used instead of wires. They’re the size of a grain of rice, and a breast radiologist can place them in the center of the lesion up to 30 days before a surgery using either ultrasound or mammogram. Then, during surgery, the breast surgeon uses a small handheld probe to accurately locate the tag and remove it along with the necessary tissue. Even though this technology is new at Centegra, Farrugia is already hearing positive feedback from patients. Centegra also recently acquired specialized technology to identify and monitor lymphedema, which is swelling that can be a side effect of surgery. When a lymph node is sampled during breast cancer treatment, the patient is at an increased risk to develop lymphedema, Farrugia says. With this new technology, he and his colleagues can now monitor for the development of lymphedema months before a physician or patient can detect it themselves. Farrugia’s overall goal is to return each patient to a life that they love living. This entry was posted on Tuesday, May 1st, 2018 at 12:00 pm	and is filed under Health & Fitness, Top Posts. You can follow any responses to this entry through the RSS 2.0 feed. Both comments and pings are currently closed.